Investor must determine its candidacy as an accredited investor. An individual is considered to be an accredited investor if he or she has a net worth of at least $1 million US dollars or has made at least $200,000 US dollars each year for the last two years and expects to earn the same amount in the current year (US $300,000 if married). An accredited investor receives the comprehensive offering materials that describe the EB-5 development project in detail. If the investor decides to proceed, the investment amount and the administration fee will be deposited into an escrow account. The investor and an immigration attorney will work together to prepare the Form I-526 petition. Form I-526 petition is submitted to the USCIS. 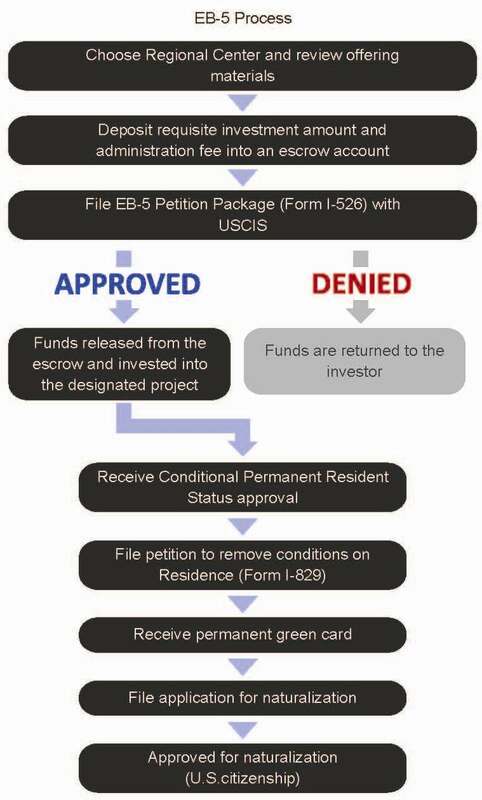 Decision is given by the USCIS, if approved; the funds are released from escrow and invested in the EB-5 development. If denied, the funds from escrow are returned to the investor. Investors with the approved Form I-526 petition will begin the Visa application with a consulate interview and upon approval, the conditional permanent residence status is granted.